Elizabeth has a double degree in industrial biotechnology and microbiology from the University of Puerto Rico-Mayaguez, an M.S. in applied biology from the Georgia Institute of Technology and a Ph.D. in microbiology from the University of Tennessee-Knoxville. As an undergraduate student, she performed research at top research centers: Harvard Medical School, the US Department of Energy, Lawrence Berkeley National Laboratory, the University of Wisconsin-Madison and the Georgia Institute of Technology. The recipient of a competitive NSF Gradate Research Fellowship, Elizabeth is the primary author and coauthor of more than 30 conference proceedings and peer-reviewed publications. Her efforts have been recognized by organizations such as the Federation of European Microbiological Societies, the Goizueta Foundation, the American Society of Microbiology, the University of Tennessee and Hispanic Business, Inc.
Elizabeth is committed to education and outreach; she has served as a mentor in the Minority Striving and Pursuing Higher Degrees of Success in Earth System Science Professional Development Program (MS PHD’S) and the NASA Student Ambassadors Program. 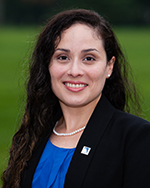 She has also volunteered in outreach activities from the Consortium for Ocean Leadership, SACNAS (Society for Advancement of Chicano/Latino and Native Americans in Science), and ASLO-MP (American Society of Limnology and Oceanography Multicultural Program). Her ultimate goal is to be in a position where she can advocate for funding of basic/applied research and broadening participation initiatives. She wants to share her knowledge with the community in order to give smart solutions to enhance bioremediation and detoxification of contaminated sites and inspire students, especially woman and minorities, into pursuing careers in science. As a CHCI Graduate Fellow, Elizabeth will be exposed to the day-to-day policy making process, which will provide her the tools to continue her plight of advocating for more funding in the areas of basic and applied research.